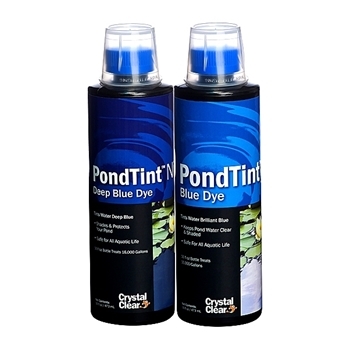 CrystalClear PondTint turns your pond an alluring shade of blue or dark blue to help photosynthesis from occurring within your pond. This will provide safety for fish from predators and will help keep the pond water cooler on hot summer days. CrystalClear PondTint is a mild dye that is not overpowering, so that you will still be able to see your fish. It is designed to function more like a car window tint instead of a complete cover. Add PondTint until desired color is achieved, reapply as needed. Do a 20% water change and re-apply. If problems continue ask a CrystalClear professional about additional treatments such as an EcoPack.